I have a heavy duty 3″ wide Soba machine vice, great for general use. 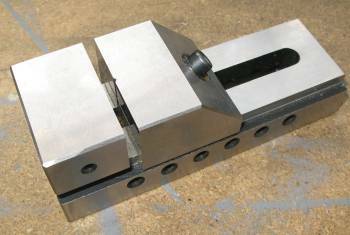 However, I often want a small precise vice to hold some of the smaller parts that I make. After much searching I ended up on arceurotrade.co.uk – a very easy company to deal with who deliver promptly. The vice is tightened with a caphead bolt that pulls the jaws at 45° so bring them together and tight onto the rails. This action means that there is no tendency for the jaws to rise away from the bed rails as the final tightening pressure is applied. The vice can be clamped down using the holes in the side of the main frame or using clamps on either end. 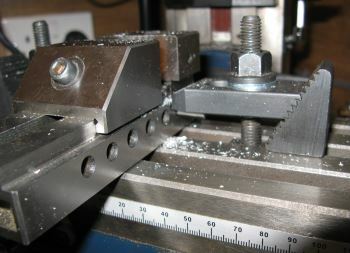 A scooped out recess at either end allows the vice to be clamped down to the table. A the other end of the caphead screw that tightens the jaws is a T-bar that can be located at different points along the underside of the frame. This is awkward at first to use, especially when you have clamped the vice to the milling table and don′t really want to release it. 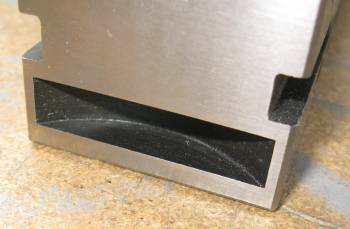 A great aspect of this vice is that it is ground square so you can align it to the milling table with an engineers square. Also, as you can see in this image I bolt the vice down by pushing a piece of 3/16″ silver steel through the holes and then use a T-clamp. This is a precision vice and the action of the jaws being pulled at 45° is just superb when you are working to very tight tolerances. Refreshing to read real English for a change. Also the pictures are clear and free from distractive clutter. Excellent presentations. Thank you.